Highpoint Dental Care offers an array of cosmetic, general and restorative dentistry procedures and treatments in a welcoming environment. We are a family practice that provides bi-annual checkups and dentistry services to generations including children as young as 3. All of our services are performed in-house, making it easier for patients to have their dental needs addressed. We realize you may have dental anxiety and diligently work to provide a comfortable setting with dentists you can trust, and that starts from the moment you enter our office. If you’re in need of a bi-annual checkup, would like to enhance the appearance of your smile, or are missing teeth, please contact Dr. Baltz and Dr. Rowe in Aurora today at 303-617-9100 to schedule your dental exam or consultation. 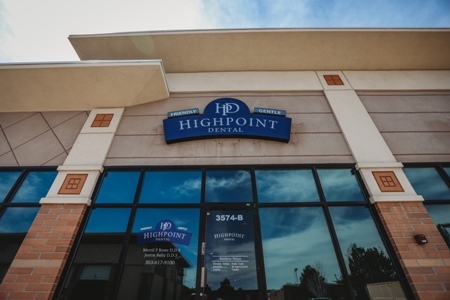 Highpoint Dental Care serves patients in Aurora, Parker, Centennial, and Green Valley Ranch, Colorado. When patients are missing one or more teeth or have suffered trauma to the teeth, jaw or mouth, restorative measures are necessary. Missing teeth are the most common issue we see as tooth loss affects more than 120 million Americans. In these instances, we recommend dental implants, which are the best way to restore your smile. Titanium posts are surgically placed into your jawbone, which fuses together over time, and a crown or other restoration is screwed into place to provide a natural-looking and durable artificial tooth. Dentures are also an option for restoring missing teeth, but some patients struggle with dentures coming loose when talking or eating. Our dentists offer cosmetic dentistry options to give you a beautiful smile. These treatments and procedures can correct nearly all aesthetic concerns such as chipped or cracked teeth, discoloration, crooked teeth, and tooth gaps. Our dentists provide emergency services to established patients. We will make sure your injury is addressed as soon as possible. Many patients end up going to the emergency room where the staff can alleviate the pain but not the issue itself. Hospitals typically don’t have the necessary equipment to treat a knocked out or cracked tooth. Trauma to the mouth, jaw, or teeth is a prime example of an emergency situation. These may occur while playing a sport, in a car accident, or involve tooth extraction for severe damage or decay. If you believe you’re experiencing a dental emergency, please call us in Aurora immediately: 303-617-9100. We can help you determine whether you need to come into our office or go directly to the emergency room. Bi-annual checkups are essential to maintaining good oral health. We stress the importance of everyday oral hygiene and believe patient education is the first step toward a healthier mouth. Dental checkups and exams should be done every six months, so we can treat problems as they arise and identify severe concerns such as oral cancer and advanced gum disease before they lead to declining health and tooth loss. Brushing your teeth twice a day, flossing once a day, and rinsing with mouthwash can significantly reduce your risk of damage and infection, saving you time and money in the end. 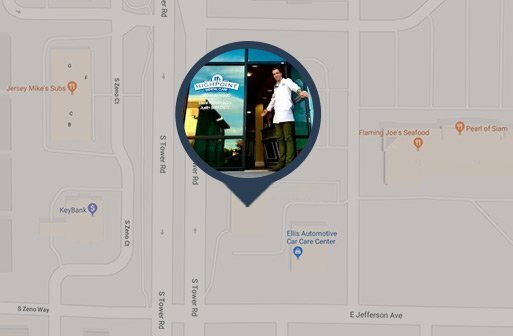 If you’re looking for a skilled dentist in the Aurora, Colorado area, please contact Highpoint Dental Care today at 303-617-9100 to schedule your checkup and exam. Drs. Rowe and Baltz provide dentistry services to patients in Parker, Centennial, Green Valley Ranch, and surrounding areas of Colorado.